Home » Blog » Looneyspoons + Team Brad Jacobs = A Recipe for Success! Looneyspoons + Team Brad Jacobs = A Recipe for Success! Will Team Brad Jacobs Sweep the Competition? Stones & Scones! Rocks & Crocks! We are thrilled to sponsor Team Canada (Team Brad Jacobs from Northern Ontario) at this week’s Ford World Men’s Curling Championships! Check out our logo on their pants! Love it! So far, so good: “Our” team is undefeated in the first five matches. Help us cheer them on to victory! All matches are broadcast live on TSN. Good for you!! Thanks for supporting Curling the roaring game. Hello to Brad & the team! Great going guys! 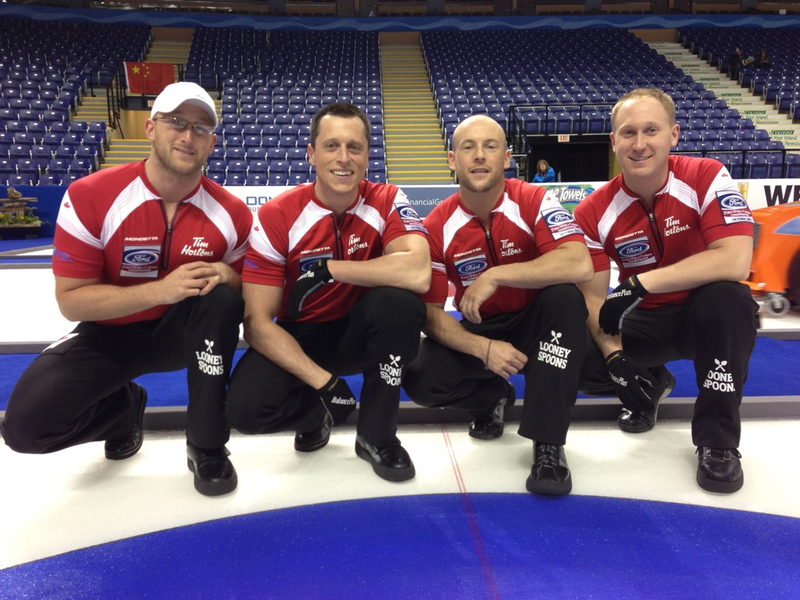 How exciting for you to be sponsoring Team Canada – love the logo on their curling pants! Go Canada Go!! Lynn, we are very excited about the sponsorship too!! The guys are amazing. Talented and super-nice! Hope they win! Effective sponsorship!!! I had to find out what Looneyspoons is because of seeing it on their uniforms! Go Canada! I have to work but have been recording the games and staying away from the news so I can enjoy every one of their games. They have been playing awesome. Last night at mixed curling we girls were discussing your logo on the pants. Love curling, love your cookbooks. Thanks for sponsoring the team. As a northern ontario curler thanks for sponsoring team Jacobs. I hadn’t heard of you until I saw your logo.So glad I Googled you great recipes,effective sponsorship. You gained one of many new customers. Go Canada Go!!!!!! So exciting that you are sponsoring our Team Canada! Looney Spoons is part of my meal plan most evening! Let’s stay positive for GOLD! I am really late to the game, but by committing to eating sensibly and with the help of many good recipes from the Looneyspoons Collection I have managed to gradually lose a good chunk of excess me without any feelings of deprivation. Love your cookbooks, if not cooking, I love to read them just for the sake of reading! They are funny and fun. So to have you sponsor Team Jacobs is a win win situation. What makes for a strong team besides hours in the gym? Hours eating delicious and fun food! Go team Canada! Thank you Greta and Janet! I had to google looney spoons while watching team canda curling team. Good on you girls for sponsoring. I’m going to bowse your website!! Your logo on team Jacobs pants has been the topic of conversation at my daughters curling nites. Congrats girls on the cookbooks and thank you for supporting our Northern Ontario aka Team Canada boys. Go Team Jacobs! We had to google Loney Spoons. We’re happy we did. Thanks for supporting the guys. Go Canada. Show them that Northern Ontario belongs. Way to go Team Canada. You did an amazing job, we are all very proud to have you wear the maple leaf! !